Black Mask #1 from August, 1974. The legendary "Black Mask" Pulp Magazine, revived after a 23 year hiatus with this ONE-TIME-ONLY issue...a SUPER RARITY, and we have this FIRST EDITION in MINT CONDITION, complete with its wrap-around cover!! Black Mask was a pulp magazine launched in 1920 by journalist H. L. Mencken and drama critic George Jean Nathan as one of a number of money-making publishing ventures to support the prestigious literary magazine "The Smart Set", which Mencken edited, and which operated at a loss. 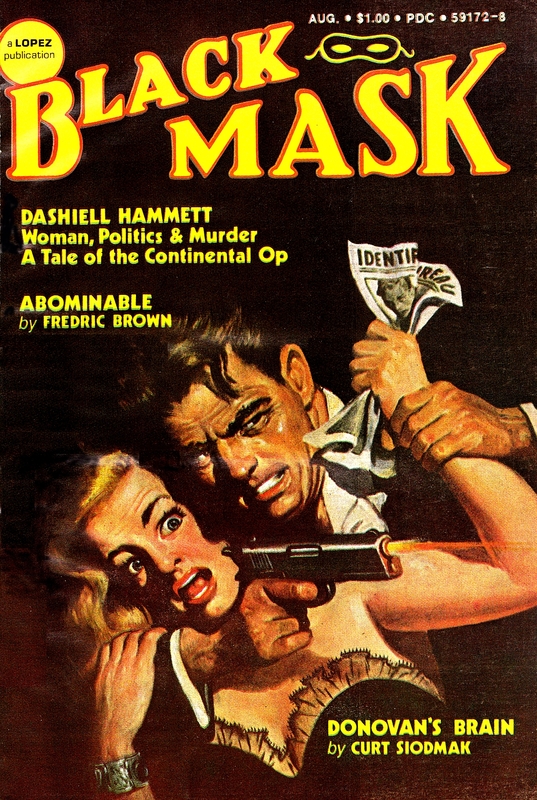 Under their editorial hand, Black Mask was not exclusively a publisher of crime fiction, offering, according to the magazine, "the best stories available of adventure, the best mystery and detective stories, the best romances, the best love stories, and the best stories of the occult." Black Mask reached a sales peak in the early 1930's, but as the decade wore on, interest began to wane under increasing pressure from the comic book market, cheap paperback books, radio and the cinema. Black Mask continued with detective potboilers and tales of the macabre until it eventually ceased publication in 1951. This COLLECTOR'S ISSUE, complete with the original ads, includes stories by Dashiell Hammett, Ross MacDonald, and the classic "Donovan's Brain" by Curt Siodmak! Earl Stanley Gardner, William Burroughs and Isaac Asimov are also featured. This is an incredible magazine, and an incredible find in The Pop Top Shop! Make it yours. Only one in stock.